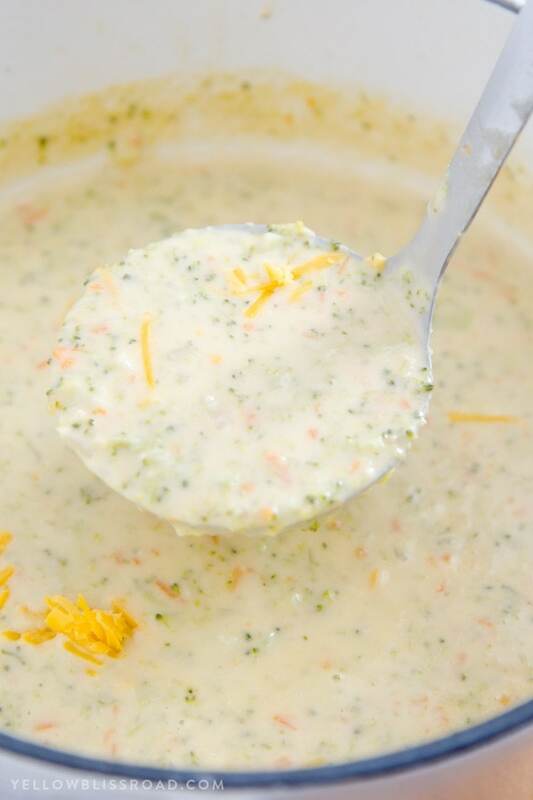 This Easy Broccoli Cheese Soup Recipe is so simple, it’s on the table in less than 30 minutes! It’s a great dinner for busy weeknights or for a cold evening when you’re craving some rich and delicious comfort food. My son has recently developed an intense love for broccoli. I wish I could say he got that from me, but I’m not exactly the broccoli loving type. He’ll eat it sauteed with a little Parmesan or raw with some Ranch dressing for dipping. And he goes crazy for it in this soup! 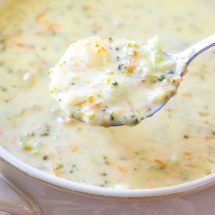 I over-bought on the broccoli a few weeks back and it was in the middle of “Storm-Watch 2017” here in Southern California that I had this sudden craving for Broccoli Cheese Soup. Could be that I had no desire to leave my house while it poured rain and hail for something like 5 days straight. Now before you tell me I should experience a Michigan winter before complaining about a few days of rain, keep in mind that California drivers get super flustered when they have to drive in said rainstorm. Not only that but there was so much rain that the streets flooded! The channels overflowed right near us and the streets flooded to the point that cars had to be towed out. Hence my desire to stay inside my nice warm house. Except that during said rainstorm and the coldest days we’d seen in quite some time (over a year, at least) our heater went out and the part that was needed to repair it would take a week to get here. So during the worst and coldest storm in the history of 2017 (ok probably a lot longer than that), we had no heat. It got down to 60 degrees in our house. Sixty degrees! I was waiting to see icicles dripping from my son’s nose! Seriously though, being cold and rainy (did I mention cold?) I knew a nice pot of soup would warm us up. So I put some Rosemary Rolls in the oven and got to work making this Easy Broccoli Cheese Soup. This Broccoli Cheese Soup literally took me 25 minutes from start to finish. The process is pretty straightforward and doesn’t require a ton of simmering and cooking time since there isn’t any meat. I used onion, carrots and broccoli, and chopped them all up very fine. The onion and carrot could even be grated to make it easier. A quick saute to get them softened was all it took before adding the broccoli and the chicken broth (vegetable broth could also be used). I like my Broccoli Soup to be a little chunky for texture so I don’t use any kind of blender. However, at this point you could use an immersion blender (aff) if you have one and want the soup to be completely smooth. I also don’t like big chunks of broccoli so I just used a potato masher to break up the vegetables. That made my Broccoli Soup just right for this little Goldilocks! 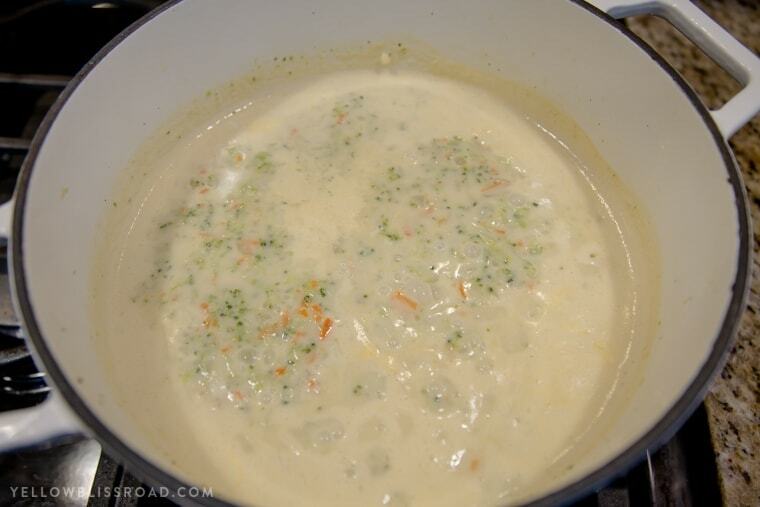 The last steps are to thicken the soup with some flour and cream and add the cheese. Finally the heat is turned off and the cheese stirred in. I used all sharp cheddar but you could add some Parmesan for a little heightened flavor. 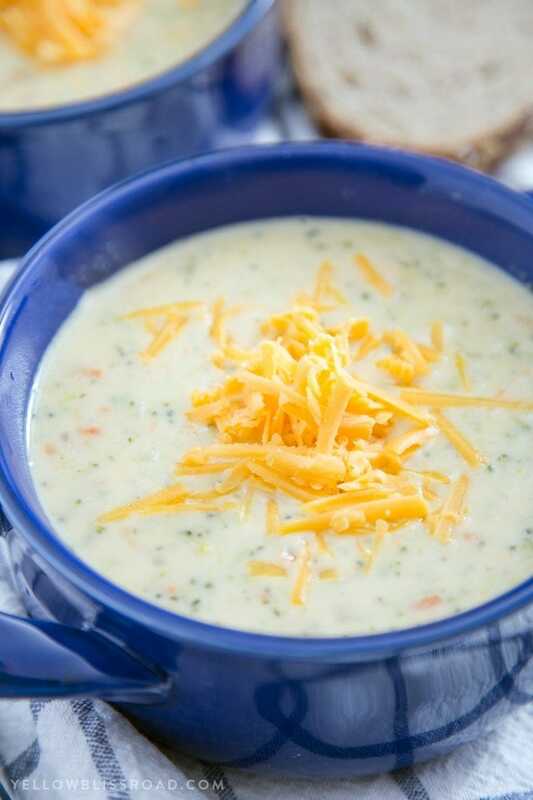 You could also increase the amount of cheese called for, for an even cheesier soup. We loved this soup, but even more I love how easy it is to make. It’s rich and hearty and filling, and my kids have no clue how many servings of vegetables they’re actually getting! 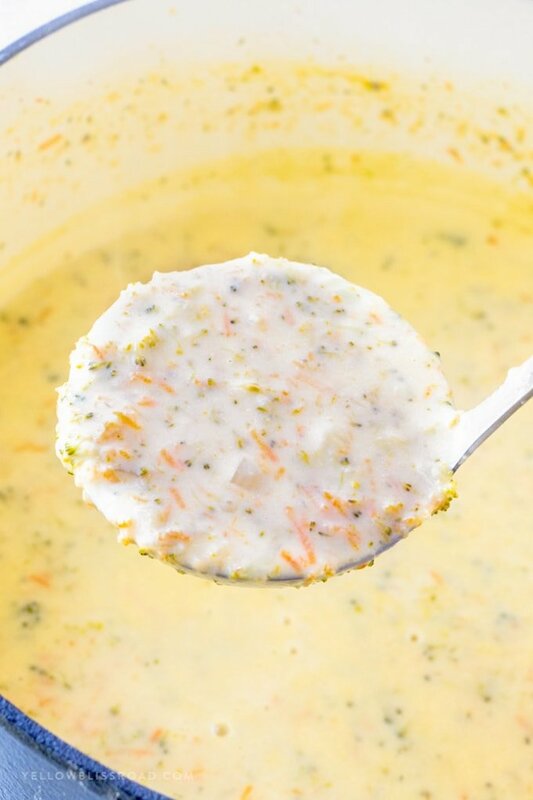 CAN YOU FREEZE BROCCOLI CHEESE SOUP? Absolutely! Make sure to store your soup in an air tight container or freezer bag (get as much air out as possible to prevent ice crystals from forming. You can store this soup in the freezer for 4-6 months. To reheat, defrost in the fridge and pour into a pot on the stove. Heat over medium-low heat, stirring constantly. Microwave reheating is not recommended as it can cause the cheese to curdle. Large Cast Iron Soup Pot/Dutch Oven: My favorite brand of cookware – this is the best I’ve ever used. It cooks evenly and heats up fast. Box grater – Grate cheese quickly and easily with this baby. I love the large handle, and the different grate sizes. (Optional) Immersion Blender: This bad boy is essential for getting soups and sauces creamy smooth. If you don’t like chunks in your broccoli cheese soup, you’re going to need one of these. 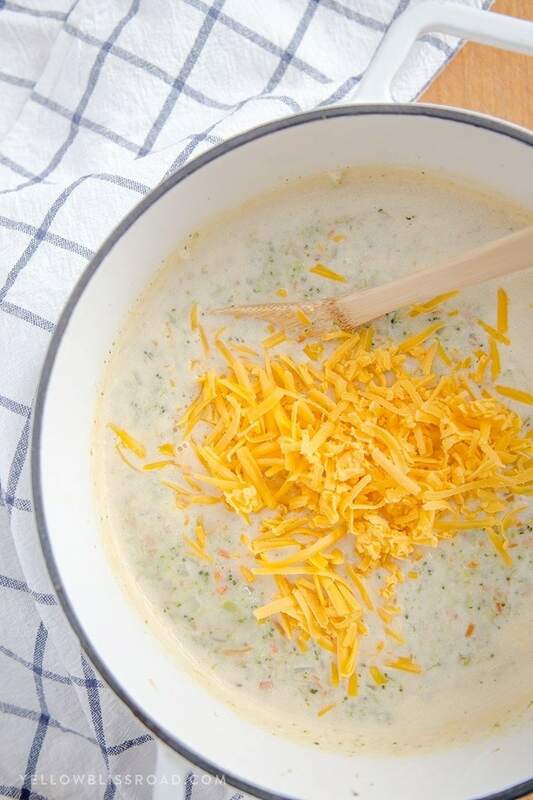 Easy Broccoli Cheese Soup is on the table in less than 30 minutes making it a great dinner for busy weeknights when you're craving serious comfort food. In a large 5 quart soup pot (dutch oven), heat olive oil over medium heat. 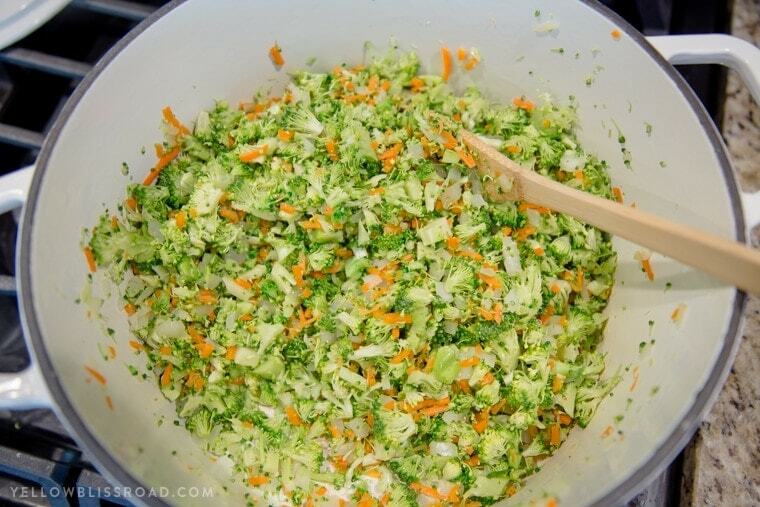 Add diced onion and carrots and cook, stirring often, until softened; 2-3 minutes. Stir in garlic and broccoli and cook until broccoli turns bright green; about 1-2 minutes. 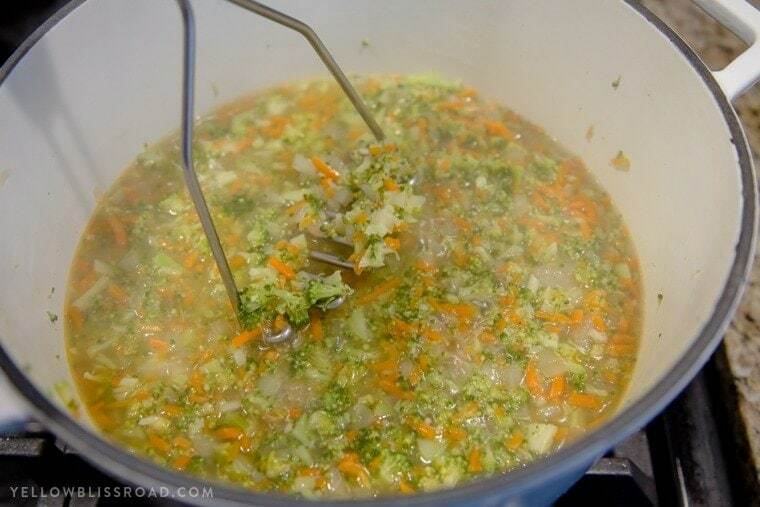 Add chicken or vegetable broth and bring to a boil. 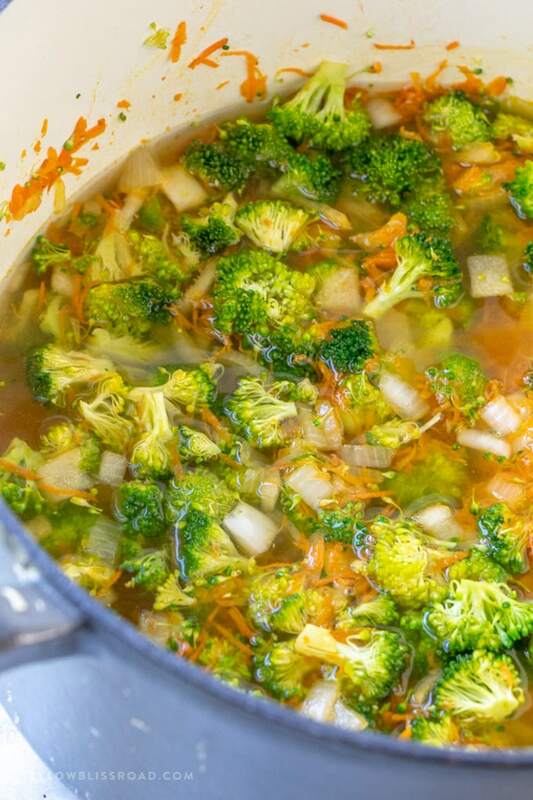 Cover, reduce heat to low, and simmer for 10-12 minutes or until broccoli is soft. Mash gently with a potato masher to break up vegetables. (This is an optional step, but if you want the soup really chunky you can skip it). In a small bowl or glass measuring cup, add the flour and slowly whisk in about 1/4 cup of the soup liquid (skimmed from the pot, without vegetables). When completely smooth (add more liquid if needed) stir into the soup pot. Immediately stir/whisk in the cream/milk and stir until completely combined. Simmer (turn up the heat a little if needed) for 5 minutes or until thickened and bubbly. Remove from heat and stir in the cheese. Continue to stir until cheese is completely melted. Serve immediately. Garnish with additional shredded cheddar, if desired. In honor of NATIONAL SOUP DAY, here are some brand new soup recipes to try (plus a few old stand-bys and favorites)! This soup was okay, but I would add at least 2 more cups of “broth” then was called for. Found it didn’t have enough for a broth-broccoli ratio. I also ended up having to add 3/4 of a block of cheese just to make it cheesy enough. The recipe would maybe be okay after some tweaking. Thank you Kylie for your honest feed back. This was delicious and perfect for a chilly, winter day! I used half skim milk and half cream to lighten it up a bit. Will definitely be making this again! 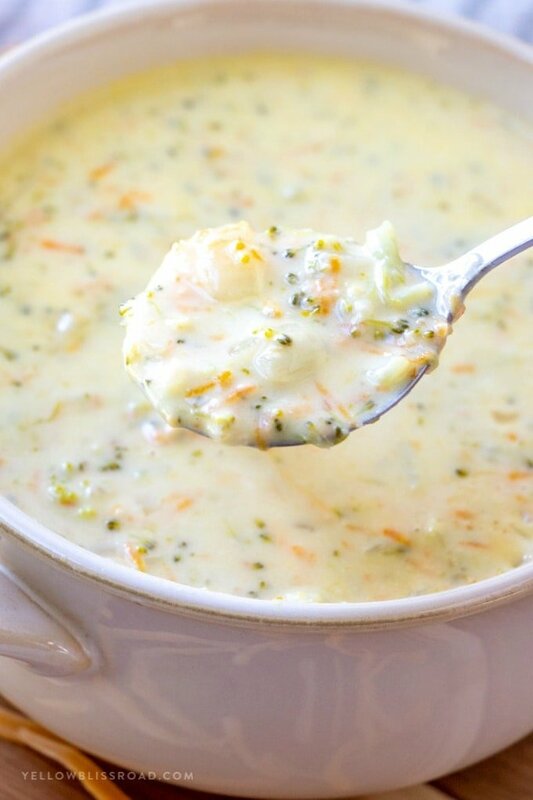 Broccoli and cheese were made for each other, and this soup!! YUM!! 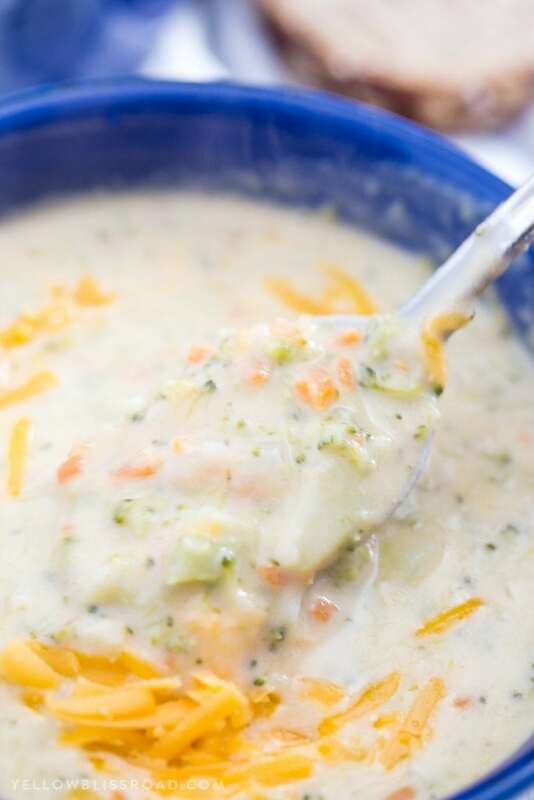 I think broccoli and cheese is like the perfect soup – always my go to, YUM! 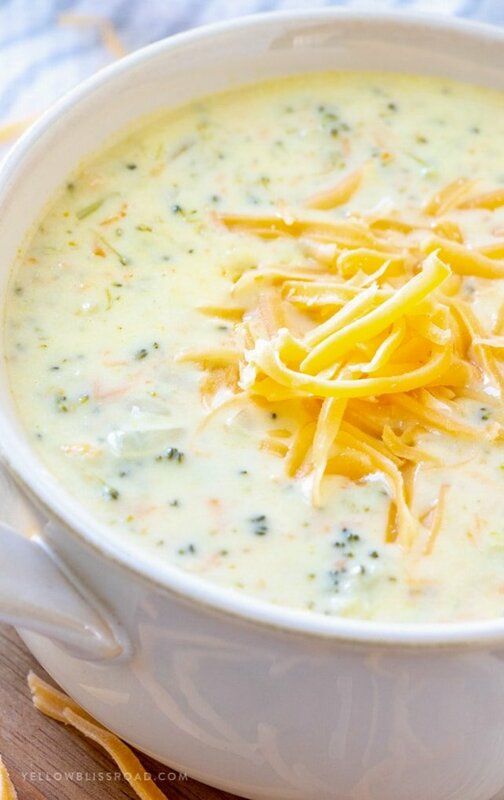 Broccoli cheese soup has always been one of my favorites. Yours looks so simple, and soooo tasty! This looks amazing, Kristin! I have loved every single recipe I have tried of yours, so I’m sure this will be fabulous. 🙂 My nine year old, who has been a super picky eater her entire life, has also recently developed a love affair with broccoli, so she will love this too! That’s so sweet of you to say Alicia! I hope your daughter loves it!